In what could become the world’s first orbiting salad bar, NASA’s Veggie experiment was initiated on May 8 after a successful (if slightly delayed) launch to the Space Station on Friday, April 18 aboard a SpaceX Dragon capsule. In development for several years, the LED-powered plant growth experiment is finally getting the chance to put down its roots. After receiving the experiment on Sunday, April 20, Expedition 39 astronauts Rick Mastracchio and Steve Swanson installed the Veg-01 unit inside ESA’s Columbus module on May 7. The next day Veg-01 was turned on, with a root mat and six small pillows containing “Outredgeous” romaine lettuce seeds within a special fertilized clay inserted inside its collapsible Teflon bellows. The lettuce plants are scheduled to grow for 28 days, during which time they will be periodically photographed, watered, and tested for any microbial growth. The pillows will be thinned down to one plant each, and after the experiment is over the remaining lettuce leaves will be harvested and frozen to be returned to Earth aboard another Dragon capsule later this year. There they’ll be tested and compared with the results of an identical Veggie experiment that’s being conducted at the same time at Kennedy Space Center. If all goes well, the lettuce will be found to be safe for astronauts to eat. While they await the results, the next experiment can be started. “My hopes are that Veggie will eventually enable the crew to regularly grow and consume fresh vegetables,” said Dr. Gioia Massa, the NASA science team lead for Veggie. The Veggie system was developed for NASA by Orbital Technologies Corporation (ORBITEC) in Madison, Wisconsin, via a Small Business Innovative Research Program. Its innovations may eventually lead to better food production not only in space but also in limited-resource regions on Earth. Learn more about the Veg-01 experiment in my previous article here. Freeze-dried bags of dehydrated “astronaut food” may seem like a fun novelty for school kids on Earth, but despite all the hard work that goes into providing the residents of the Space Station with nutritious and varied meal options there’s one thing that remains a rare and elusive commodity on astronauts’ menus: fresh produce. In development for several years, Veggie is now getting its chance to be space-tested with the launch of the SpaceX-3 resupply mission. Veggie uses clear collapsible bellows as miniature greenhouses, inside which plant “pillows” can be cultivated with the aid of root-mats and a bank of LED lights. Astronauts will see how well “Outredgeous” romaine lettuce fares in microgravity inside the Veg-01 experiment, and can also use the LED bank as a light source for other experiments. 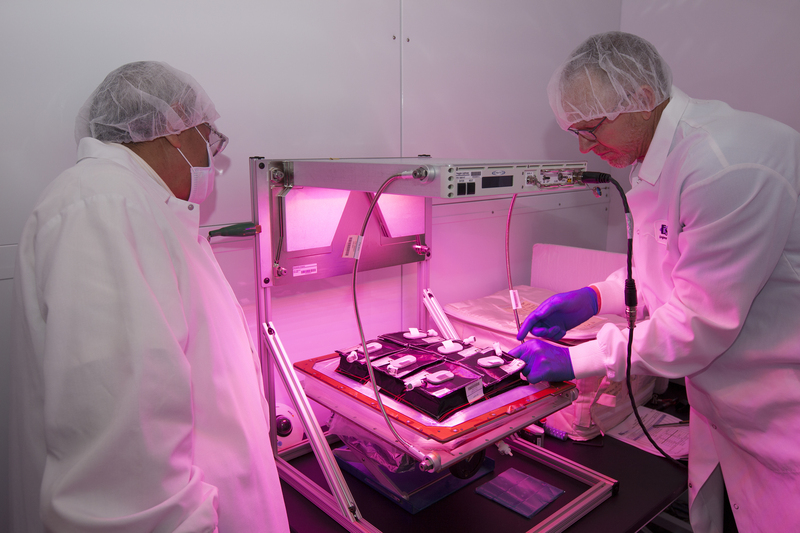 While other plant-growth experiments are currently aboard ISS, Veggie boasts the simplest design and largest growing area of any of them to date. In addition to providing fresh food, maintaining a miniature garden in orbit would be therapeutic for astronauts on long-duration missions. The Veggie system was developed for NASA by Orbital Technologies Corporation (ORBITEC) in Madison, Wisconsin, via a Small Business Innovative Research Program. Its innovations may eventually lead to better food production not only in space but also in limited-resource regions on Earth. Read more in the NASA news article by Linda Herridge here, and learn more about the Veggie project here.